When Wendy Bartlett, Lin Dickens and Fatima Ismael forged their partnership in 2016, there was one clear objective: to create a premium coffee brand which placed sustainability at its core whilst empowering women. Fast forward to today and the brand has created significantly more opportunities for women (including the development of a biscuit factory), won numerous awards (including the FSM Marketing Award) and has become an integral part of the bartlett mitchell service offer. For an initiative that is just two years old, Perkee has had a fantastic start. It is now the coffee brand of choice in almost 40% of bartlett mitchell sites, more than 100 Perkee baristas have been trained, and more than half a million cups of Perkee have been sold since it was first launched. Crucially, bartlett mitchell coffee sales have increased by more than 22%. Last month, Wendy (founder of bartlett mitchell) and Lin (Marketing Director) caught up with Fatima when they visited the Soppexcca (Sociedad de Pequeños Productores y Exportadores de Café which means: Society of Small Scale Producers and Exporters of Coffee) cooperative and several members’ farms in Nicaragua where Perkee is produced. Fatima oversees Soppexcca, Wendy and Lin were keen to discuss how together they can further grow and develop the brand, as well as witness the impact coffee is having on real lives. 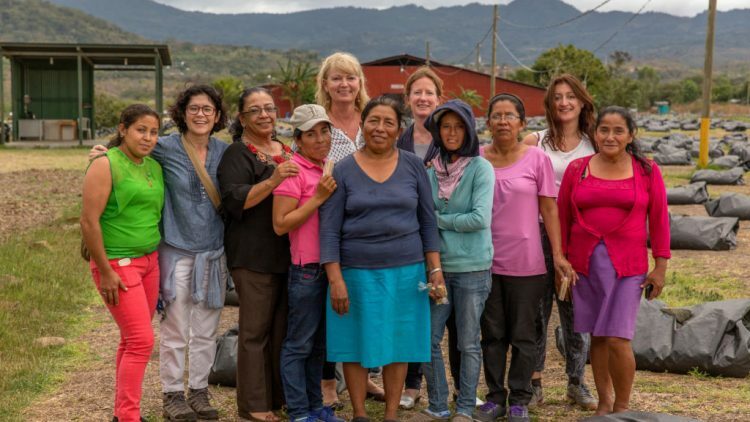 With closer focus being placed on the role of women in business, the pair travelled to the Jinotega region, with the aim of understanding the difference that Perkee coffee makes to women’s lives and to find out how bartlett mitchell can further support the coop. “We’ve been delighted with how Perkee has developed; it has exceeded all of our expectations but we know there is more we can do. That’s why we wanted to visit Fátima and the team to see what opportunities there were for us to take our relationship further,” says Lin. “Verifying our faith in the ethics of the organisation was one of the reasons we went. We had a packed schedule as we wanted to see as much as was possible in the time we had there. Whilst we knew the team and the unique model well, we know things have moved on a lot in two years and therefore had lots of questions,” adds Wendy. It was Wendy’s drive to forge a partnership with a unique and entrepreneurial business which brought Soppexcca and her company together. Soppexcca has a membership of 670 farmers, made up of 240 women and 430 men. The management centre of the cooperative, the Board of Management and the Surveillance Committee, are comprised of 40% women – a figure many UK plc’s would be envious of. The cooperative, as you’d expect, aims to improve the lives of the community it operates in. Its profits are ploughed back into education, diversification, health screening, capacity and awareness building in areas such as environmental conservation, climate change adaptation and the promotion of equality throughout the rural communities it operates in. It is made up of 16 primary coops which produce small farm speciality coffee. As well as this, it also appoints mentors to help younger members, so knowledge is passed on. This puts sustainability and empowerment at the very core of the organisation. “As soon as we arrived and met with the management team, it was clear that the team had a relentless focus on sustainability. They had to. The whole model was geared around bringing stability to the farmers, their community and their families,” said Wendy. Their focus was impressive. A plant to make organic compost has been set up using, amongst other elements, coffee pulp, chicken waste. The coop undertook a four-year project review to measure the impact of this organic solid and liquid fertiliser. As well as costing 30% less to the produce than a proprietary version, it helps to deliver, with the appropriate farm management techniques, a much higher crop yield. Soppexcca has employed a young team of agronomists who have studied horticulture and agriculture at university to help share this knowledge in an applied manner with all its producer members. It was clear that the coop is taking a long term view and planning investments in a way that will allow them to achieve goals in the short, medium and longer term. Looking to the future is as much about people as it is produce. Women, especially in rural communities, historically, didn’t have bank accounts so they had no way to buy a farm or earn an income. Because of Soppexcca women now own their own farms. Sustainability runs through everything they do. So much so that, during the visit, Wendy and Lin met women working at a drying mill (where the coffee goes through the final stage of production, removing the last layers of dry skin, sorting and preparing the beans for shipment), who explained that, during the ‘thin months’, where traditionally the harvest is over and there is no work or little income, they are supported by Soppexcca to set up a business making honey and sesame biscuits. She adds: “This really meant a lot to us as we are very keen to help provide women with opportunities to better their health, education and wellbeing. This doesn’t just have an impact on individuals but communities as a whole. Wendy has since agreed to support the coop with the development of its ‘out-of-season’ activity, ploughing further investment into the business. Despite the great strides Soppexcca and its producer members have made and continue to make, there are big challenges. Namely, climate change. Temperatures have increased between 0.5 and 3oc in the region in the past century, and they are expected to rise another 2.1oc by 2050. Roya (leaf rust) decimated their coffee production in 2012, and scientists warn that warmer weather will cause even more harm because the disease thrives in high temperatures. Crop diversification is one of the ways the coop is seeking to adapt to this climate change. Low-altitude areas have become unsuitable for growing coffee as temperatures heat up, so the farmers are planting Cacao. It is early days and the coop is investing with training and support for the farmers. All of this makes planning difficult, however, given that sustainability sits at the heart of Soppexcca’s strategic objectives, it places a great focus on young people. The management board naturally see them as the future of the farms. The young people involved in various programmes are not only are engaged in the cacao initiative but they are also running their first chocolateria. Another major issue is investment and credit. This, according to Fatima, is a significant problem. She says: “When you have no choice you have to keep looking to the future because it could be a matter of life and death, it really focusses the mind.